Feira da Ladra - Fleamarket.. Located in Campo de Santa Clara, not far from the Alfama district, Lisbon’s Feira da Ladra (Thieves Market) has been in existence since the 13th century. People gather at this open-air market to buy and sell items in the shade of centuries-old buildings. Photographs from the end of the 19th century reveal a flea market that looks much like it does today. No doubt items sold then would be considered antiques today, but the air of lively trade is just what it was then. 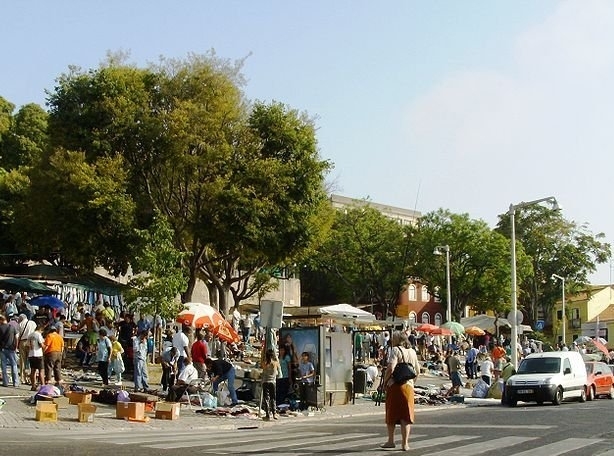 Every Tuesday and Saturday morning tourists and locals alike flock to Campo de Santa Clara where they find dozens of stalls lined up along this hilly avenue. Beautiful silver or brass candlesticks are proudly displayed on one table. Fascinating glassware sit on another nearby. Tiles, ceramic works of art so beloved in Lisbon there’s even an entire museum dedicated to them, can be found on yet a third table. If you find yourself a little down on luck, the colorful ceramic roosters are symbols of good luck to the Portuguese. These colorful birds, which can be found in many places in Portugal, also make good souvenirs. Other stalls offer much more than brightly painted birds. There are clothes galore. Shoes of a sort that would be found in an upscale store. Belts handcrafted by the masters of Portugal. Dresses both relaxed and colorful as well as classic and refined. In short, anything and everything for both the bargain hunter and the seeker of the divine in couture is offered at the Feira da Ladra Thieves Market stall. Not surprisingly, many of the items reflect Portugal’s past as a great seafaring and trading nation. Carvings from former Portuguese colonies in Africa are just one sample. White lace from Tunisia is another. African masks, small statuary and more grace the area for those who seek the exotic at a bargain price. But there are also a wide variety of items from within the country itself that are no less interesting and collectible. Pottery from Redondo are offered by those who treasure the local art as much as the distant. Handmade toys from faraway Porto and items from a castle in nearby Sintra are just as likely to await the treasure hunter at Fiera da Ladra. The vendors are friendly and willing to bargain with anyone who returns that goodwill. Be prepared to see the mundane and the unusual side by side. Be ready to spend. For, at the Thieves Market, those who steal are not welcome!